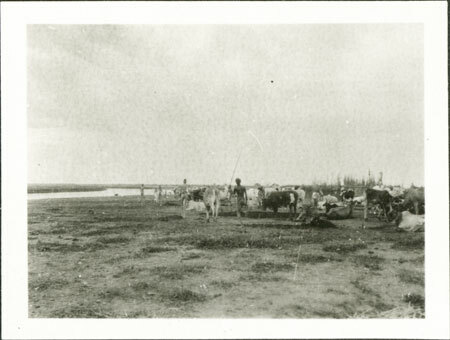 A dry season cattle camp near a large river, probably the Sobat, with cattle tethered near to windbreaks and men herding. As the dry season progressed in about January or February, larger cattle camps such as this with a greater population density would be formed called wec mai. This image may well be of Yakwach camp on the Sobat river where Evans-Pritchard spent 3 months in 1931 among the Lou Nuer. Note on print reverse ms pencil - "2 116 "
Morton, Chris. "Nuer cattle camp " Southern Sudan Project (in development). 03 Jan. 2006. Pitt Rivers Museum. <http://southernsudan.prm.ox.ac.uk/details/1998.346.116.2/>.